Gallery artist Damian Stamer is exhibiting in two museum exhibitions this summer: "Altered Land: Works by Damian Stamer and Greg Lindquist" at the North Carolina Museum of Art in Raleigh, NC and "The Things We Carry: Contemporary Art in the South" at the Gibbes Museum of Art in Charleston, SC. Greg Lindquist and Damian Stamer, both North Carolina raised, create shimmering landscape paintings, simultaneously abstract and representative, that slide in and out of focus. Their environments—from the natural to the manmade—are haunted by the past, appearing to be in the process of eroding, degrading, or fading into nothingness. Memory and loss, as well as the effects of time and economic and environmental ravages, are at play in these beautiful, melancholy landscapes. 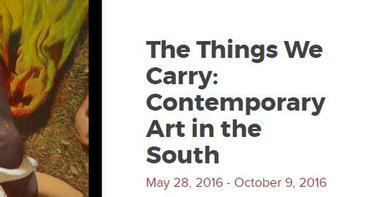 The Things We Carry: Contemporary Art in the South features paintings, sculpture, photography, and mixed media works by a diverse group of nationally-known contemporary artists. Together, these artists address the troubled history of the American South and the many ways that history is represented today, including artistic responses to the tragic shooting of nine parishioners at Emanuel AME Church in Charleston on June 17, 2015. The exhibition provides a venue where the Charleston community and visitors alike can come together in the spirit of understanding and unity, inspired by the art on view. Participating artists include Bo Bartlett, William Christenberry, Sonya Clark, Andrea Keys Connell, Lonnie Holley, Deborah Luster, Sally Mann, Stephen Marc, Mike Smith, Damian Stamer, and Stacy Lynn Waddell.